For full information about nominating the next Poet Laureate of Oregon, click here. The Oregon Cultural Trust, Oregon Humanities, and Oregon State Library jointly request nominations for Oregon’s next poet laureate, who will be a bold and articulate voice for culture across the state and contribute thoughtful eloquence to our public life. Paulann Petersen (pictured), who has served since 2010, completes her second term in April 2014. 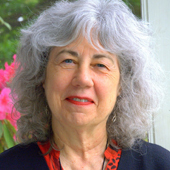 The Oregon Poet Laureate fosters the art of poetry, encourages literacy and learning, addresses central issues relating to humanities and heritage, and reflects on public life in Oregon. The poet laureate will provide at least six public readings per year in settings across the state to educate the public, as well as community, business, and state leaders, about the value and importance of poetry and creative expression. Additionally, the poet laureate will undertake a significant cultural project or projects throughout his or her term, sharing poetry with people or communities of the state that might otherwise have little opportunity for such an experience.